Lexington, Ky. – The winter competition season in Florida came to a close over the weekend at the Kingdom of the Sun CDE in Ocala, Fla. 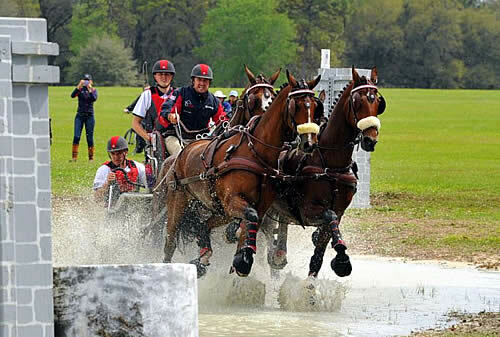 Single Horse and Four-in-Hand drivers aiming for the 2016 FEI World Driving Championships competed in the CAI2* divisions, which served as Selection Trials. Donna Crookston climbed the leaderboard to win the CAI2*-H1 division, while Chester Weber won the CAI2*-H4 division. Crookston (Saltsburg, Pa.) had a respectable dressage test with Viktor to receive a score of 61.96 and sit in third place following the dressage phase. She and her 2008 Dutch Harness gelding had a spectacular marathon phase, finishing first at all seven obstacles. They handily won the phase and added 81.77 penalty points to their score to sit second in the overall standings. Crookston and Viktor had a single ball down at 5C for 3.00 penalty points to win the cones phase and secure the win with a final score of 146.73. Barbara Chapman (Metamora, Mich.) and Meara Beval, her 2004 American Warmblood mare, finished in second place at just 0.02 penalty points behind Crookston and Viktor with a final score of 146.75. Leslie Berndl (Newcastle, Calif.) and Uminco, her 2001 Royal Dutch Warmblood gelding, rounded out the top three with a final score of 152.02. Weber (Ocala, Fla.) drove some newer talent as part of his and Jane Clark’s KWPN team, but still had top performances in the CAI2*-H4 division. He and his team had a solid dressage test to earn a score of 50.16 and finish second in the phase. They had an excellent marathon performance to win the phase with a score of 114.44 and move into the overall lead. Weber and his team added 4.44 time penalties to their score in the cones phase to win the phase and claim top honors in the division. Allison Stroud (West Grove, Pa.) and Willow Star LLC’s Dutch Warmblood team finished in second place with a score of 181.43, while Craig Grange (Delmar, Iowa) and his team finished third on a score of 228.85.